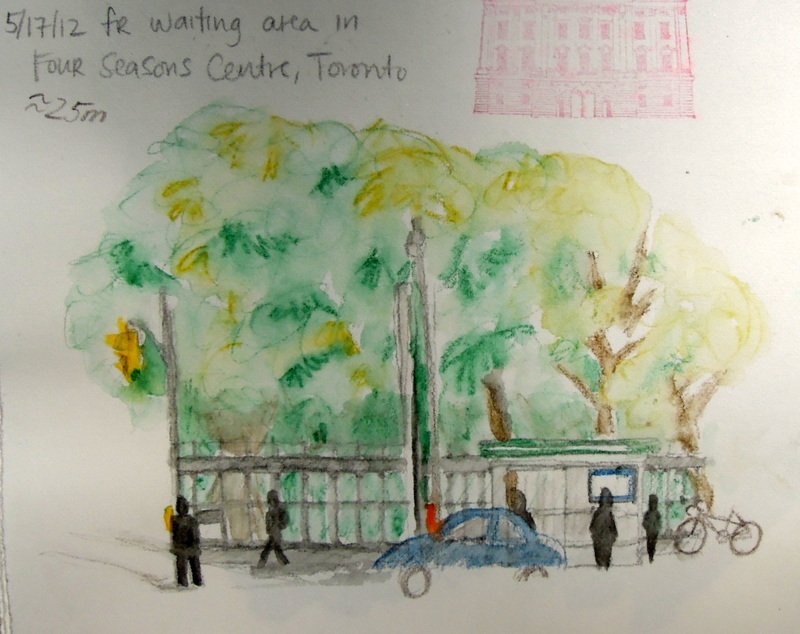 Yesterday I took the subway to the Four Seasons Centre to hear a noon concert. 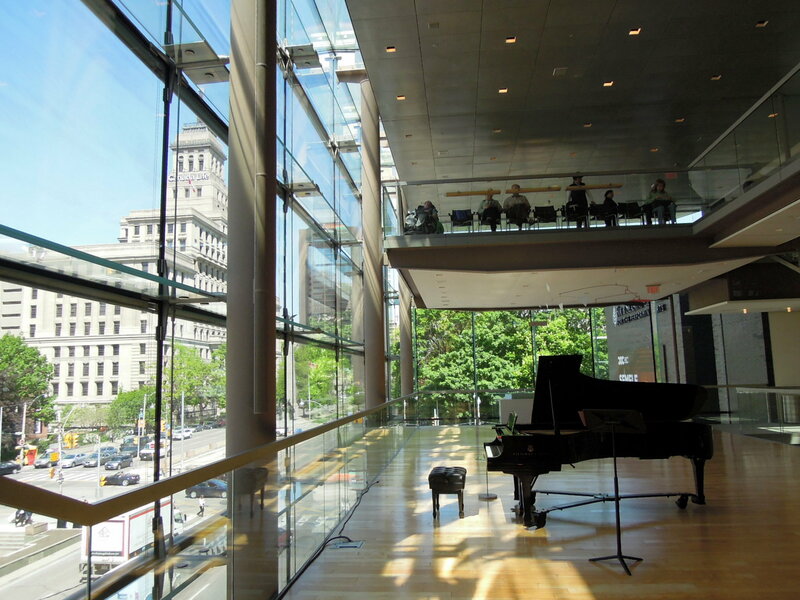 To my great pleasure and amazement, the Canadian Opera Company offers these concerts free of charge, 2-4 times a week, from September to June. That alone almost makes me want to move to Toronto! While waiting in line, I sketched the view across the street. Most of my fellow concert-goers were absorbed in conversation or reading a book, but a few of them noticed my drawing and spoke to me. Maybe sketching in public is a good way for me to meet people on my shyer days, when I’m not as willing to approach strangers on my own. I couldn’t believe we were getting 65 minutes of live music in this gleaming light-filled space, free — and all I had to do was show up; I didn’t have to sign up for anything or reserve in advance. We had half an hour before the concert began, so I made a quick sketch of the piano setup, and then chatted a little with the sweet lady sitting next to me. She said she tries to come to these concerts as often as she can, and they have fed her soul through a difficult time of her life. “After a concert, I just feel nourished,” she said, smiling. I haven’t been to an opera since we lived in LA, and I certainly never sat as close to the stage at the Dorothy Chandler Pavilion as I was sitting to the performers here. I forgot how much acting there is in opera — it’s as much about expression and gesture as it is about musicality. The demanding Schubert “Die schöne Müllerin” song cycle is a first-person story (in 20 songs) of a wandering miller who falls in love with a beautiful miller’s daughter, only to lose her affections to a huntsman. Kramer took us through the gamut of emotions from optimism to infatuation to despair. It was a fantastic concert and I enjoyed every minute of it. If you want to listen to the song cycle, here is a lovely interpretation online, sung by Randall Scarlata, with piano by Jeremy Denk (from the Isabella Stewart Gardner Museum in Boston, via Wikipedia). I recommend it. You may also want to read more about the song cycle, or refer to the text and English translation in this PDF file. Wow! Beautiful music in a beautiful setting — and free as the air you breathe. Toronto rocks! And your knowledge of music is awesome too. Hee, well, I do know a good bit about classical music, but not vocal. I’d never heard of this particular Schubert song cycle before now. 🙂 I had to look it up for this post! Good for you. You are painting!!!!! Thank you, Carla!! Yep — or sketching with those water-soluble pencils anyway. I can’t thank you enough for turning me on to them. 🙂 They change EVERYTHING about sketching out in the world!! And just think, “all I had to do was show up”! Life is grand that way, waiting to show us things and teach us through experiences – many of them free of charge. You can’t get a sweeter deal than free, great music, in a beautiful place. Keep on showing up! The world awaits you.